When it comes to WordPress, you can pretty much set up your site any way you want. The default setting is similar to the way most blogs; including mine, are set up with the latest blog posts showing up on the home page. 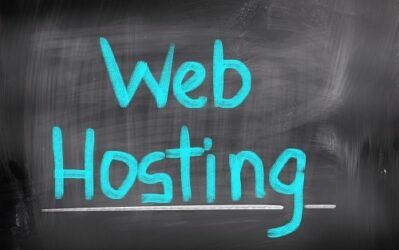 But this doesn't have to be the way you run niche sites on WordPress! You can in fact, set up your homepage to display a static page, a static post, or a combination of static posts and latest posts. In my post today, I wanted to walk you through some of the different ways to create a static homepage on WordPress. Before I get into the “nitty-gritty” of how to create a static homepage on WordPress, I wanted to discuss whether or not this is the best option for your niche site. For the record, I have sites that are ranked #1 in Google that use a static homepage OR that just have the latest posts displayed on the homepage. I do like the control that having a static homepage gives you over the content on your root domain; however, its not necessarily required to get your site ranking #1 in Google. So, if you decide to just use blog style posts on your homepage that's okay. For the most part, I prefer to have the homepage of my niche sites static with my primary article targeting my main keyword. So, below I am going to discuss 3 set up options for your WordPress niche sites. Instead of creating all of your articles as “posts”, you can make your primary article that targets your main keyword a “page” in WordPress. Then within in the WordPress “settings” and then under “reading” you can select to make your homepage display this page as “static”. Here is what it looks like if you are not familiar with what I am talking about. 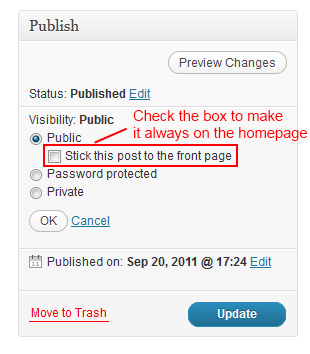 This option will allow you to make a post “sticky” so that it always shows at the top of your homepage. This is a great option that I have started using on a regular basis to always display my main article targeting my primary keyword on the homepage. This is what I am currently doing with my authority site that I have discussed in the past. This makes it very easy to always keep your primary article at the top of the homepage. Future articles will either be published below the primary article on the homepage (if you have selected to show multiple posts on the homepage) or just in your latest posts however you choose to display or link to those. So, there are 3 different options that you can use to create a static homepage using WordPress. I personally like to use option number 2 of creating a post that “sticks” to the homepage. 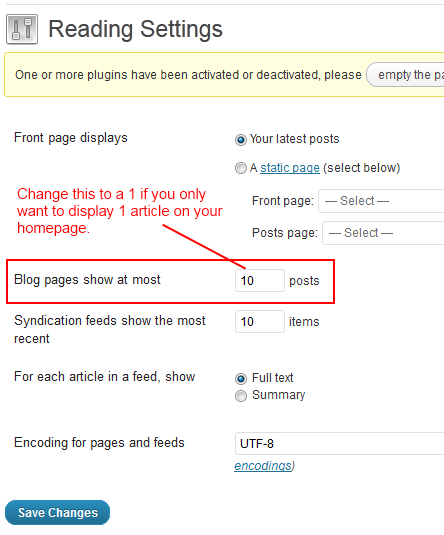 However, I usually also change the default setting from displaying 10 posts on the homepage to 1 or 2. There is no exact science here, that's just how I currently do it because I think it looks good on the site overall, and it gives me complete control over what is being displayed on the homepage of my sites. Overall, I hope that you find some of these options useful as you create your own niche sites using WordPress! I'm sure there are some other tips or tricks that I could be using as well to do the same thing. However, overall, these options should allow you to display your posts that you want. Finally, I will also point out that some themes only display small portions of the article on the homepage. If you are using a theme that only displays small blurbs of your latest posts, then you can still use option number 1 to create a static homepage. My favorite themes always display the full article on the homepage. So, what are your thoughts on the subject? Do you have any other tips or tricks that you use with WordPress to display your content as effectively as possible? I would love to hear your thoughts on the topic below! 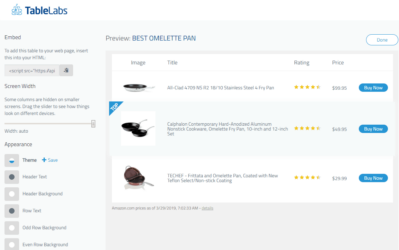 Ranking Higher in Google and Selling More Products: Week 12 Recap! Thanks for the info! I just got into blogging and am thinking of creating some niche sites. I will definitely try this out. Indeed. Spencer did an amazing job with this site. I usually use the pages as my home page. Wow, thanks Ampi and Lemuel! I had no idea that posts could be made static. I have usually gone for pages in order to make them permanent on a niche website, but this certainly is a handy trick! Thanks. Glad you found it useful Neeraj! The post is not made static, it’s just made a sticky post, meaning it doesn’t proceed down the page when new posts are made. Static pages don’t have duplicates in the archives, or the blog index like posts, so they are truly static/single pages. I would also like to know how can i hide the date without amending the code. Seems to me most “offical like” site didnt show date. Go to WP admin – settings – general. Set date and time format to custom, blank the field, that’s it.. Thanks Ric! I actually didn’t realize this was an option before…thanks for sharing! I learned the hard way (hacked) the less plug-in’s we can use the better. I’m not saying the one you recommend is bad, I’m only saying the more plug ins used – the more opportunities a hacker has to backdoor a site. I agree, that’s why I only listed 6 plugins that I use on my last post. More plugins does equal more opportunities for hackers to break in. First off, gotta love the the image of the girl with the “static” electricity going through her hair while she touches the WP tesla orb! LOL. 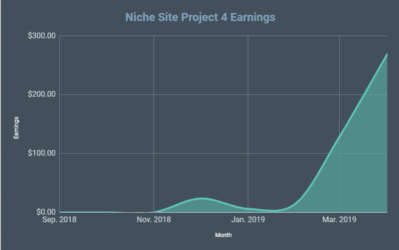 I like having a static post/page on my niche sites(the few that I have) The main purpose of this static post/page is to welcome the visitors to the site and contains the main keyword I’m trying to target for the niche site. What I also do (to pass some homepage authority link juice) is add a “Most Recent Post” in the sidebar so 1) Visitors can see my latest post and 2) Makes it a lot easier for SE to crawl from my homepage to my newest content. Not much…just wanted to share! I do a kind of similar thing…I have a sticky post at the top of the page which is keyword rich, and then have one post displayed underneath (the most recent) for the freshness bonus. My sidebar has links to the last twenty or so blog posts for more homepage (and site-wide) link juice bonuses. Sounds like a great strategy Jenni! Thanks that was some thing, i wanted to know from long time. Do you see some sites vanishing after 3-4 months form serp. because some of my good sites lost from top pages and hence significant loss. I assume this part of alogorithm. For me this is general knowledge but what I don’t know since I don’t have the amount of niche sites you do is how each of these may benefit my rankings for the site. This was a reat post with tips I paln to use. I always wondered how static pages were set up and you gave clear examples. Thx for sharing these great tips. great post Spencer. in my experimentation thus far, I have found the static pages to outrank the dynamic/random page theme layout. this has a lot to do with how I personally execute the interlinking within my website. Definitely a fan of the very 1st option you mentioned here. Use it on basically every single niche site that I have setup and it works great! For one reason or another, the static page has helped me tremendously when trying to rank my niche sites via Google. I need to try a site without it to see if there is any difference. I really like option 2 also as the sticky post works great. I think it also works good for sites that you want to explain how the site works. That way the explanation or instructions are out in front of the visitors each time they visit. For niche sites it is great because your main article targeting the keywords you have chosen are the first thing seen. Recently, I have learned Method 2 and using it. The reason that there is “fresh” google algorithm and I try to publish a new post every week or other week. Or I could rotate the old post and keep the “keyword” rich one always on the top of the front page. I think Method 1 is great for those 5-page mini site though. Hey Spencer , thanks for such a useful information. I have been always confused about the home page of my site.I do not much clear that whether i should static or latest post option especially for the adsense sites.It is easy to decide for the niche sites that you can choose static home page but for adsense i was not so clear.But now you make me clear. Maybe because I started building sites from scratch in HTML pages are my preferred method of building WordPress niche sites. I actually find all this blogging stuff confusing and am just starting to come to grips with it. I build larger sites using blog pages and categories because I think this gives you a real advantage in SEO over using pages when it comes to a bigger site. If I could use categories easily with pages I would switch in a heartbeat. 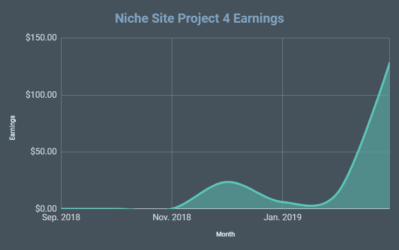 On the last couple of niche sites I added a blog and have been doing short (350-450 word) posts to keep the site active and linking back to the pages. I think this might be helping with ranking the sites but too soon to tell (need to test it on more sites also). Best of luck with your sites John! Thanks once again Spencer for this invaluable coverage. I will start using these tactics in my upcoming niche sites projects. Nice share.. actually I use the 1st method for my Static homepage. BTW, where do you get all the images for your post? Thanks for the information. I knew what a “static” page was but always wondered what “sticky post” meant! 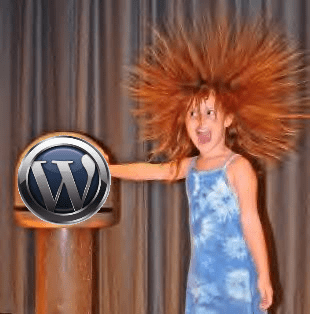 Thanks for the info on different ways to publish on a WordPress site. Another great post Spencer! 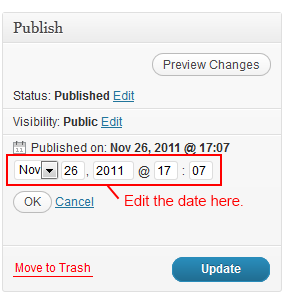 I have a semi-related question: can you change the order of posts in WordPress that have already been published by changing the publish date and then re-publishing? Yes! The order of posts is determined by date, so you most certainly can do that. I don’t enable comments usually because its too difficult to keep up with all the spam on so many sites. Great post, I have a question about option 3, when you have more posts published than you have specified for the homepage (you suggest 1). It paginates, so you get them listed on separate pages. It adds a page like: “/page/2”. I worry that this is bad for duplicate content? Any thoughts on this? If I understand correctly, I don’t think that’s an issue. Should a nice site only have *one* page/post that clearly targets the keyword chosen, and then all other pages/posts be longer tail/related keywords? I have my keyword littered all over the site (I’m new to this by the way!) and I’m wondering if that’s hurting me. How much should I be using my keyword throughout the site? Yes, you should only have 1 post that specifically targets your primary keyword. The rest of your articles might targeted related or similar keywords – but not the exact same keyword. You want 1 page of your site to be totally optimized for your primary keyword (preferably the same keyword that matches your domain name). 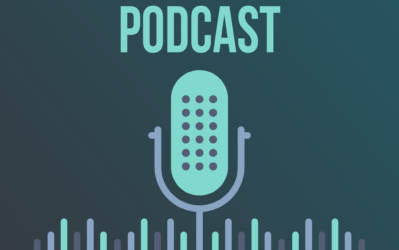 If you are using your keyword on all the articles on your site, this is essentially keyword stuffing and can indeed hurt you. I use my primary keyword no more than 1% of the time on my main article. It may be used a time or 2 in other places, but certainly not in every article. 1) when i publish the 1st post as page what should i put as the page name? Home or article title ? 2) when i post the 1st article as a page i don’t see any category option for this. There is a “parent” option but not sure how to utilize it. Should i just leave the 1st article/home page article without any category? 3) when i post the later articles i assume i should publish them as “post” and then create category for those. Is it ? 1. Put the article title FOR SURE. 2. There are no category options for pages. You could alternatively just do it as a post and make it a sticky post so that it always shows on the homepage. Thanks Spencer, I have found this post very useful. I keep referring to it while tweaking my niche sites. Cheers Brother. Very good post. I didn’t know you could make a page static. This is a very good trick. Thanks! 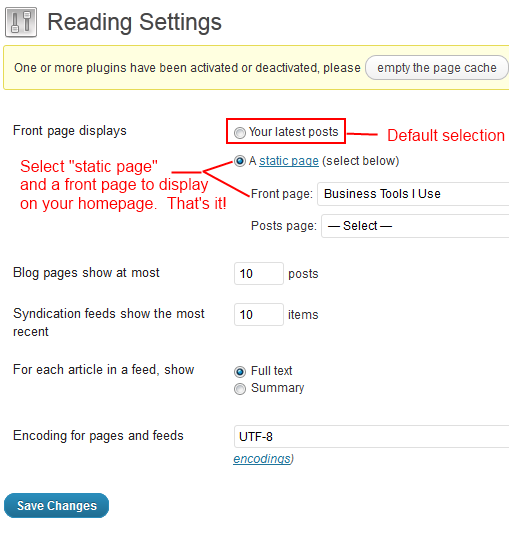 An old article but this just showed me how to set your home page as a static page. Cheers Spencer! wow I was looking for it. I employed option 1 in my site. Hey spencer, I just made a site with the nich website theme and I have no homepage! So I named a page home and made it the static page but the title of the page keeps on appearing where the post title should be. I see that you’ve made a static page on your knife site, how can I do the same with mine? Create a page. Then go to “appearance” then “reading” in WordPress; select the radio button for “static” homepage. Select your page, that’s it. (Its a wordpress function, not a theme function). I am having problem with my niche site. Shall I make a static page or a post page as the home page ? And , is the sticky post ,you mentioned, optional m? Out of the two, sticky post and static page as the home page, which will have better SEO benefits for the primary keyword?